Following the miscarriage of a much-longed-for child, Katharine Norbury sets out – sometimes accompanied by her *nine-year-old daughter, Evie – with the idea of following a river from the sea to its source. The luminously observed landscape provides both a constant and a context to their expeditions. But what begins as a diversion from grief soon evolves into a journey to the source of life itself, when a chance circumstance forces Norbury to the door of the woman who gave her up all those years ago. The idea of following a river from the sea to its source had its origin in a novel by the Scottish Writer, Neil M Gunn, The Well at the World’s End. It tells the story of a protagonist on a journey who goes alone into the wild place of Scotland, telling anyone he meets that he is searching for the well at the world’s end. His only child has been stillborn. Unfortunately Norbury gave Gunn’s book away but she became determined to undertake the character’s journey. I became determined to undertake Peter Munroe’s journey, although I couldn’t have explained why. I, too had reached the end of my youth. I, too, had lost an unborn child. These were, possibly, the only points of connection between me and the fictional hero; but maybe that was enough. I certainly shared a sense that there was something beyond my grasp, something out of reach, and perhaps the idea of a secret well was a good a way of expressing it as any. Having journeyed to the family cottage, somewhere on Garn Fadryn’s flank, Evie and Norbury discuss their project, the plan to find the well at the world’s end by following watercourses from the sea to their sources. ‘Can we count the Mersey?’ Asked Evie. ‘I think so,’ I said. ‘ I don’t think it has to be the same river that we follow, as long as we eventually get to an end.’ Evie thought about this, then nodded her agreement. We could count the trip to the Mersy estuary as an exploration of ‘sea’. Evie wrote an account of the picnic in her journal. She drew a picture of the beach with the Antonys. Each chapter of this landscape memoir is named after a meaningful place, often a body of water. The narrative landscape is filled with beautiful observations of nature and an inner emotional life often described using myths and metaphor to explore the meaning of belonging. They decide to follow the river that comes out at Cable Bay. My task this summer. The task I had set myself, was to look back. To turn my back on the sea, on what It might mean, and walk back on myself. 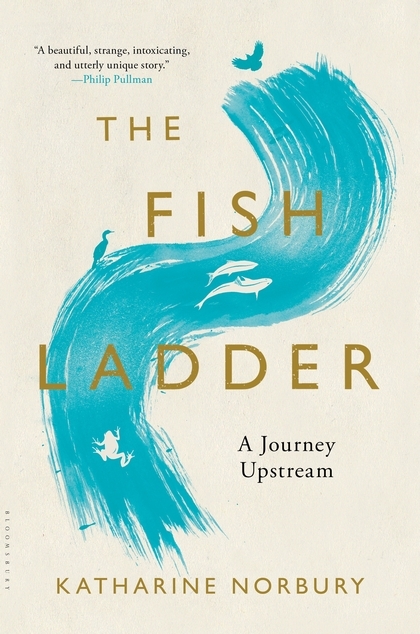 Norbury is doing more than walking back on herself, she is following the central metaphor of the memoir, The Fish Ladder, following the journey of the salmon that once swam in the Mersey to their breeding ground upstream in a river somewhere. Following the mysterious innate instinct that is still one of the unknown mysteries of our world. But I found, as the summer progressed, that I had accidentally embarked on a journey to the source of life itself…I had been adopted as a baby…for some reason, perhaps connected with, or triggered by, this new lost baby, I started to dwell upon this mystery. Of who I was, and where I’d actually come from. Of whom we speak when we talk about our family. The author tells us it is the story of an accidental journey “to the source of this, particular, life”. There are many coincidences along the way. It is documented that coincidence and synchronicity+ are prevalent in adoption searches. Strange coincidences that cannot be explained. Similarly the author finds herself visiting a hotel, that used to be a convent. And it is here that she discovers she was born and named after one of the nuns. I had found a missing piece in the broken vase of my history, accounting for the lost months of my babyhood. I had been born in this place and now by chance, I had returned. It was as though I had been given a coat that turned out to be a perfect fit without ever having realised that I was cold. I found it hard to remember that the gift was new, and that yesterday, or even an hour ago, I didn’t have it. Attempting to follow various rivers from the sea to their source, Norbury’s journeys take her to Spurn Point in east Yorkshire, to St Mary’s Well on the Llyn Peninsula, and to the River Severn. But they take her much further than mere landscape, Norbury’s search for her hidden history, her foundling past, isn’t just a whimsical journey, it is much more important than that. She is on a life-saving quest, for both her emotional self and her daughter’s future. And it is not just a miscarriage that Norbury is recovering from, for shortly after that happened, she was diagnosed with breast cancer and had a double mastectomy. Here then was an urgent need to discover not only her family history but her genetic history too. The Fish Ladder is a beautifully written travelogue, memoir, exquisite nature writing, fragments of poetry and tales from Celtic mythology. It explores the void, the hole, the ‘missingness’ that can quite suddenly engulf a person who has experienced trauma as a baby or a young child. In Norbury’s case, triggered by the loss of a baby, which quite possibly boomeranged to the original emotional loss or separation from not only a mother who abandoned her, but a foster nun who mothered her. At times it read like a mystery which only added to its synthesis of writing styles and made me turn the pages even faster. The descriptions of nature are exquisitely written and it is more than worthy of its Telegraph Best Book of the Year 2015, and various long listings. Quite simply it is both ordinary and extraordinary, and this is its appeal. A powerfully written memoir that is also a love story. Love for nature, for parents, for child, and for husband. This is a narrator in love with with life. Katharine is appearing at the Finchley Literary Festival, see more here. +Synchronicity and Reunion (1992), by L.H. Stiffer who explores this phenomenon further. This entry was posted in Blog, Care Leavers, Orphan Lit, Reviews. Bookmark the permalink.